After a summer of recharging the football batteries with a few trips to the Olympics, The Daggers Diary team are back. 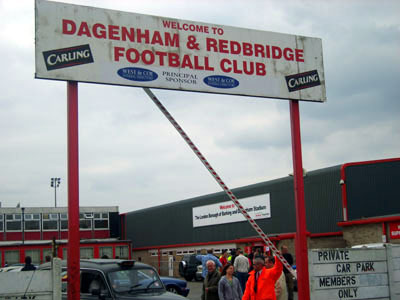 Tonight marks the opening game of the 2012/13 season for the Daggers, and the twenty first since the merger of Dagenham with Redbridge Forest . Under normal circumstances of course, the campaign would start in bright sunshine on a Saturday afternoon with the first league game; these though are not quite normal circumstances, and so with the league campaign kicking off a week later than normal because of the Olympic Games, the first round of the League Cup comes first. Pre-season has gone reasonably well for the Daggers. The two games I did actually attend resulted in comfortable wins at Gresley and Concord Rangers. On the last two Saturday’s the first team has beaten Brighton (4-0) and West Ham (6-3) although a large, asterisked note should be made against both of these results, and this is that both of these were against “xi” teams. It’s easy to get excited about beating teams by these score-lines, especially in pre-season when optimism is at its strongest, but this must be tempered with the knowledge that they were achieved against players that might not to be expecting to play too much first team football in the forthcoming nine months. While Olympic duties prevented me going to the Brighton game (having already got a ticket to see a thoroughly entertaining quarter final game at Wembley between Senegal and Mexico), I couldn’t claim the same for the West Ham game. It’s just my luck that the one time I don’t see us play my other team (albeit not the first team), they win, and I am out on the Essex coast, soaking up the rays and watching Southend Manor advance to the preliminary round of the FA Cup by beating Hullbridge 1-0. The close season also brings departures and arrivals from the playing staff. We are now down to just a handful of players who were at Wembley two years ago for the play off final, and of those, Darren Currie has now joined the coaching staff, having been last spotted playing for Hendon against Canvey last November. Another arrival has been Gavin Hoyte from Arsenal; another relative youngster at the age of 22, his arrival means that we will probably see a lot more of Abu Ogogo in central midfield, much as we did towards the end of last season. Ogogo has now been promoted to club captain following his contract renewal in the summer. Although there were more than a few worried that he would be on his way following the expiry of his previous contract, he re-signed and now replaces Mark Arber with the armband. Arber has been one of the departures during the summer. Reactions to this were probably split 50-50 between surprised and not. Although there were glimpses of his best play season, it’s certainly arguable that there weren’t enough. Of course, injuries don’t help and Arbs certainly had a few last season. The other major departure was Peter Gain. Again, injuries were a major part of his season, and like Arber, leaves having been part of a Daggers team that provided probably the greatest day in the history of the club so far. I think all Daggers fans will wish them well. Although I haven’t been here since the end of last season (apart from the club house to watch the England games in Euro 2012 and to collect my season ticket), nothing seems to have changed much. The signs on the walls of the car park still tell those entering that it’s a private car park and for members only, the big red demountable learning centre still occupies an unfeasibly large part of the car park, and the staff whether outside or inside the ground are all still the same. There are times when I wonder if they are actually allowed to leave over the summer, or whether they have to mount some kind of “Great Escape” style exit, via an elaborately constructed tunnel system. You can only hope that when they get to Dagenham East station and are having their oyster cards checked, that they don’t make the same mistake that Gordon Jackson did getting on the bus. I’m not sure about my fellow fans, but it’s a bit of a come down after the Olympic high over the last couple of weeks. It’s nice to be back and see familiar faces at the club, but with the past two weeks having been such a success, having a league cup tie is certainly like coming back to earth with a bump. Sitting in the clubhouse prior to the game, it’s amazing how quickly we are all back into the swing of things, taking the mick out of each other. This reaches new levels when radiostu walks into the bar. Stuart is one of the media stalwarts of the club, working for BBC London Radio. He is on the lookout for two victims/volunteers to do a short piece for the radio about our hopes for the forthcoming season. Young Merse decides that he can’t do it as he hasn’t had his hair done, which prompts a volley of comments, reminding him in varying degrees that it’s radio, not television. Eventually I am press-ganged into going by good old fashioned peer pressure, and on the way Dagenham Dan is collared as well. For Coventry , they will be hoping that their stay in the third tier will only last one season, following relegation in May. Recent results in this competition haven’t been great for them, although they are better than ours. Whilst Coventry have at least reached the fourth round in recent times, our involvement in the competition is usually over by around 9.30pm on the night of the first round. With the games spread over a few days this year, we’re not the first ones out, which means that even before a ball is kicked, we’ve done slightly better than normal. It’s a sunny evening, and clearly the referee want to get the game going, as our man on the microphone Brownie is still telling us who the officials are as the match starts. The programmes still hadn’t arrived by kick-off, which had already prompted much gnashing of teeth, and panic amongst those that can’t do without them. There is an announcement during the half that they had finally arrived, which meant that Liam was dispatched with each of us giving £3 to get our own respective copies. With all that change crammed into one pocket, it looked as though he was walking on a slope. The first half is watchable, but its still (sort of) got the demeanour of a pre-season game, which it is, given that the league hasn’t started yet. In the early stages, Coventry appear to be first to the ball, and move it around quicker than the home side. There were two divisions between the teams last season, and at times it does show. However, Chris Lewington is not really forced to save much, and as the half wears on, it starts to be a much more even contest. In the last six or seven minutes, we get a flurry of chances at both ends. Scott Doe is unlucky with a volley that hits the top of the crossbar, before Femi Illesanmi is just wide (from our angle at least) with a long range effort, although Murphy in the City goal looks to have it covered. Josh Scott has the final home shot of the half, and again his angled drive is just wide. However, to make sure that we don’t forget them, Coventry have a half chance through Gary McSheffrey, although his effort is also wide. It may have taken forty minutes, but the teams look to have finally woken up. The second half is better than the first, but neither team can really dominate. Neither keeper is forced into any difficult saves, which is either a testament to both defences or a damming indictment of the attacking play. Whatever it is, we are not going to be ending up with nine goals like the weekend just gone. Twenty minutes before the end, extra time starts to become a possibility. It’s the first time anyone mentions it, and as we watch, it just looks more and more likely that we will be here for another half an hour, which could be frustrating especially at the tea bar has now shut. It doesn’t matter in the end. As the fourth official fiddles with the electronic board to show the amount of time to be added, Michael Spillane fouls Richard Wood, and a spot kick is awarded to Coventry in front of their fans. There is a sense of disappointment as Kevin Kilbane scores from the spot, and although there is a roar of encouragement when the three minutes of additional time is announced, we don’t really do anything in those last few moments, and so the sun sets on another Daggers campaign in the League Cup. This makes it six defeats from six games, which when you think about it, is remarkably consistent. I mean, there can’t be many teams that are that consistent over six years. Overall though, it’s been a decent performance. There is experience in the team in terms of games played at this level, but in terms of age, it is still a young side. With Abu now captain at the age of 23, he is one of one of the older players. Over the course of the season, it could go one of two ways; either we will rise to the occasion and surprise people, or struggle and endure another year like last year. A nice, mid-table finish has never looked so appealing. This entry was posted in Dagenham & Redbridge, nPower Championship and tagged Capital Cup, Carling Cup, Dagenham & Redbridge. Bookmark the permalink.